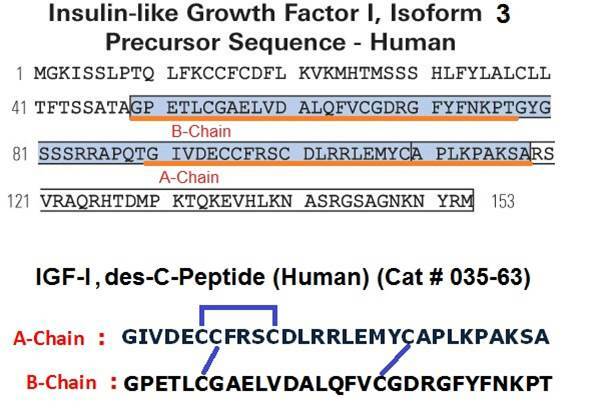 Human IGF-I is a single chain 70-amino acid polypeptide cross-linked by 3 disulfide bridges, with a calculated molecular mass of 7.6 kD. 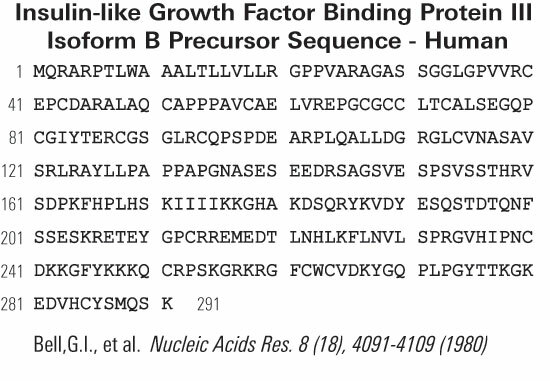 The IGF1 protein displays homology to proinsulin. The IGF-I structural gene maps locus 12q22-q24.1.The IGF-I coding region is flanked by sequences encoding an amino-terminal peptide of at least 25 residues and a carboxyl-terminal peptide of 35 amino acids. The findings provided evidence that IGF-I is synthesized as a precursor protein that undergoes proteolytic processing at both ends. Insulin like growth factor 1 (IGF-1) and its receptor (IGF-1R) provide a potent proliferative signaling system that stimulates growth in many different cell types and blocks apoptosis. In vivo IGF-1 acts as an intermediate of many growth hormone responses, and may stimulate the growth of some types of cancer. IGF-1 also provides a mitogenic signal to act as a growth factor for many tissue culture cells. One component of IGF-1 mitogenic signaling is association of the receptor tyrosine kinase with Shc, Grb2, and Sos-1 to activate ras and the Map kinase cascade (raf, Mek, Erk). An endpoint of the Map kinase pathway is modification of transcription factor activity, such as activation of ELK transcription factors. Serum response factor (SRF) and AP-1 contribute to mitogenic signaling by many factors. Phosphorylation of IRS-1 and PI3 kinase activation are also involved in IGF-1 signaling, similar to insulin signaling. Serum insulin-like growth factor-I (IGF-I) levels at the higher end of the reference range have been associated with increased risk for the future development of prostate cancer. We determined whether high serum IGF-I levels are associated with precancerous lesions of the prostate. We conducted a case-control study to determine whether high serum IGF-I levels were associated with the presence of high-grade prostatic intraepithelial neoplasia (HGPIN) among patients who presented for prostate biopsy because of an abnormal serum prostate-specific antigen level or digital rectal exam. We measured serum IGF-I and insulin-like growth factor binding protein-3 (IGFBP-3) prior to prostate biopsy and compared them between 103 men with HGPIN (cases) and 205 men with normal prostate histology (controls). The mean IGF-I level in patients with HGPIN (130.2 ng/mL) was significantly higher compared with controls (118.8 ng/mL, P = 0.01). The mean IGFBP-3 level in patients with HGPIN (2,393.9 ng/mL) was also higher compared with controls (2,276.0 ng/mL, P = 0.06). After adjusting for age, prostate-specific antigen, digital rectal examination, and ethnic background, the odds ratio for a HGPIN diagnosis among men in the highest relative to the lowest quartile of serum IGF-I level was 1.94 (95% confidence interval, 1.0-3.7; P = 0.04). The potential association between a high serum IGF-I level and the presence of HGPIN may represent an important clue to understanding the basis for the relationship between IGF-I physiology and prostate cancer risk. Larger studies will be required to confirm this relationship. Nam et al. Cancer Epidemiol Biomarkers Prev. 2005 May;14(5):1270-3. To elucidate the physiological role of insulin-like growth factor-I (IGF-I) during early pregnancy in mares, number of ovarian follicles was monitored ultrasonically during different stages of the first trimester of pregnancy in 36 thoroughbred mares. From 9 of 36 mares, blood samples were collected weekly from the mating day till the end of the first trimester of pregnancy and plasma IGF-I profiles were examined with other hormones, like follicle stimulating hormone (FSH), luteinizing hormone (LH), ir-inhibin, progesterone and estradiol-17beta. Plasma IGF-I level fluctuated throughout the studied period with four peaks on the 7th, 28th, 49th and 84th days of pregnancy. Plasma IGF-I showed a positive correlation with plasma FSH (P<0.05), whereas no correlation was found with other hormones during the studied period. Plasma IGF-I had no correlation with the foetal size, but positive correlation with the number of large (> 30 mm) and medium (10-30 mm) follicles. These results suggested that IGF-I might produce from the medium and large follicles during early pregnancy and promote to develop their growth via pituitary FSH mediated effects in the mares. Balance of proinflammatory and antiinflammatory agents regulating the acute-phase response. An adequate balance will lead to resolution of the process. Fernández-Real JM, Ricart W. Endocr Rev. 2003 Jun;24(3):278-301. Caviedes-Bucheli et al. Expression of insulin-like growth factor-1 receptor in human pulp tissue.